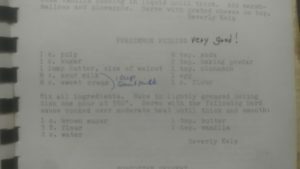 Persimmon Pudding – Very Good! Persimmon pudding is a staple dessert of Southern Indiana. Hang around enough country folk long enough and you’ll hear talk about how the persimmon trees are coming along, where the best persimmons can be found, and the secrets of the best persimmon pudding this side of the Wabash. 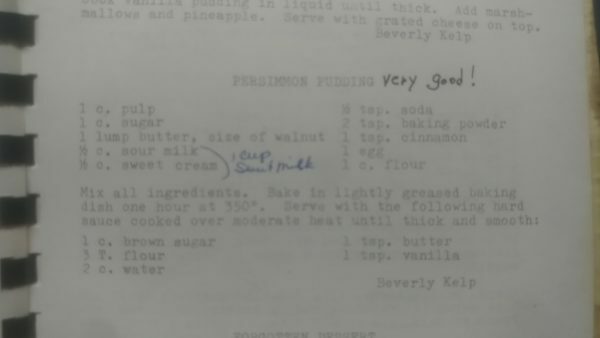 Beverly Kelp provided this recipe for the third edition of the Brown County Cookery put together in 1961 by the Wesleyan Service Guild Methodist Church in Nashville, Indiana. The previous owner of this cookbook noted this recipe as “very good!” next to the title. Persimmon Pudding - Very Good! Mix all persimmon pudding ingredients. Bake in lightly greased baking dish one hour at 350 degrees F.
Serve persimmon pudding with the hard sauce cooked over moderate heat until thick and smooth.